Sandi at Rose Chintz Cottage is having a pink tea today to support breast cancer awareness month. Stop by, and visit the nicest bloggers in blogland! I'm drinking coffee this morning, hence the "pink coffee" rather than tea, with my favorite breakfast, a piece of toasted Ezekial bread. I can get my carb fix, plus protein to keep me going in the morning. Ezekial bread has 4 g of protein per slice, and is satisfactorily crunchy. The beautiful little pumpkin was made by Celestina of Southern Day Dreams. I got three of her lovely handmade pumpkins from her etsy shop last week. Gorgeous, and she does such lovely packaging, too. The teacup is the classic American Beauty by Royal Albert. It was my daughter's very first eBay purchase back in the day, and I subsequently went and got one, too. I'm not the only one in the pink this morning. This is my daughter's go-to-work smoothie . . . I love your pretty teacup for 'coffee' and I didn't take a pic, but had mine in a sort of pink mug too! Love the pumpkin you got from talented Celestina. Your DD's pink smoothie looks yummy. Have a wonderful week sweet friend. Beautiful cup and saucer I am a great fan of Royal Albert. The dishes are absolutely beautiful! I've never heard of it before but the Ezekiel bread looks delicious! I am so glad you have coffee...I love it. The Royal Albert china is gorgeous-we lived in Worcester for a few years before coming to Cornwall and I would often visit the porcelain factory shop-you would like it! Your breakfast looks delicious! What a beautiful pumpkin you have from such a talented lady! Your china is absolutely gorgeous! Have a wonderful week! Oh, that pink smoothie looks delicious and I adore American Beauty! It is the last teacup on my list to acquire. I have the saucer but need a cup. I always enjoy my coffee in the morning and your toast looks good sitting on that sweet plate. I know that pattern but can't think of the name at the moment. Celestina makes beautiful items, doesn't she? I won a hand painted bunny from her in a giveaway one time and it was beautifully packaged. She is a dear! Your little pumpkin is adorable. 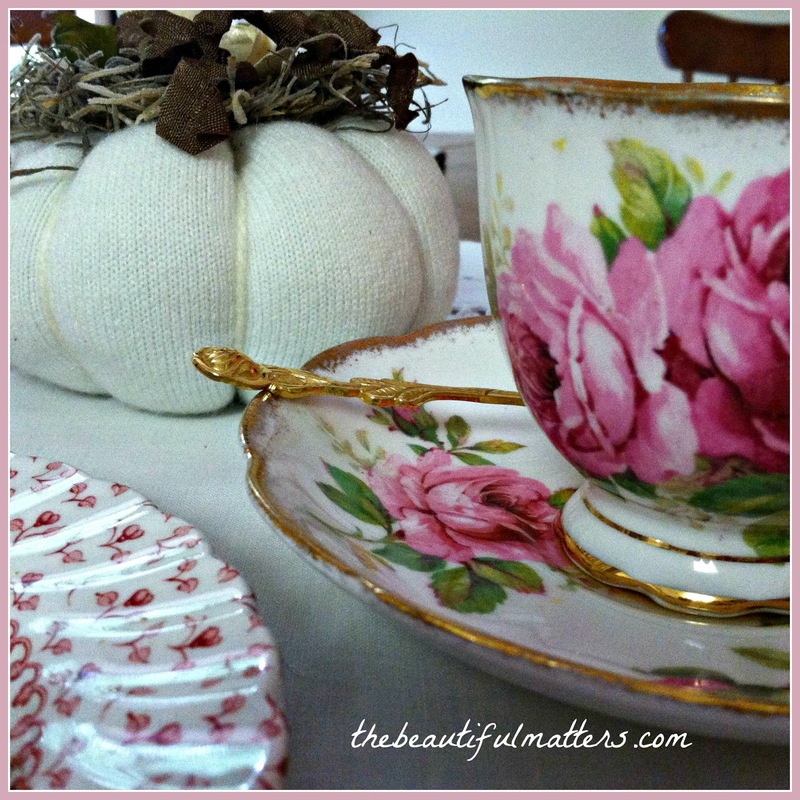 Thank you for sharing & supporting my Pink Tea Time this week and have a fabulous day, Deborah. The plate is by Johnson Brothers, and is called Rose Bouquet. Thank you, Sandi. Lovely porcelain cup & saucer by Royal Albert! That makes for a very happy start of the day and the bread is a healthy choice too. As for 'Celestina Marie Design', I felt honored for being able to give her a recommendation in 2011, on LinkedIn about her being such a fine lady and great artist! Enjoy your purchase from her and yes, she is quite an artist in packaging things! I have the same tea cup ~ love it! I think I will have to give the Ezekial bread a try too ....sounds like a healthy choice along with my smoothie. Royal Albert is always the best. Hi Deborah, so happy to finally be able to visit. Our family company left for home after a long weekend. Your post is beautiful and I love your gorgeous teacup. What a lovely collectible. Your daughter's smoothie looks so good and healthy. Thank you for sharing your pumpkin. You are so kind to give me the mention. I hope you enjoy it for many years to come. Thanks for sharing and your kind visit and comment to me too. Many a time I've had toast and tea in the afternoon, it's a comfort food combination! The pumpkins Celestina made are sweet and your daughter's pink smoothie looks pretty yummy. 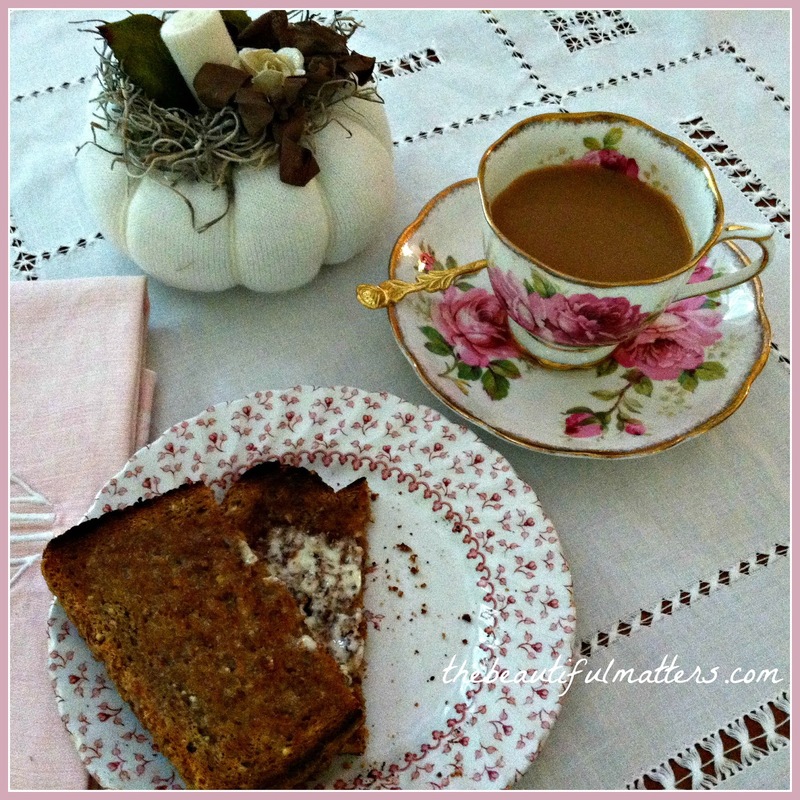 Ooh...love this beautiful pink rose pattern on the china...and you are eating my most favorite bread in the world! Several years ago, a friend introduced me to Ezekiel bread...love it with peanut butter and honey on it...sooo crunchy and good! Aha, someone else who uses their cups for coffee too! 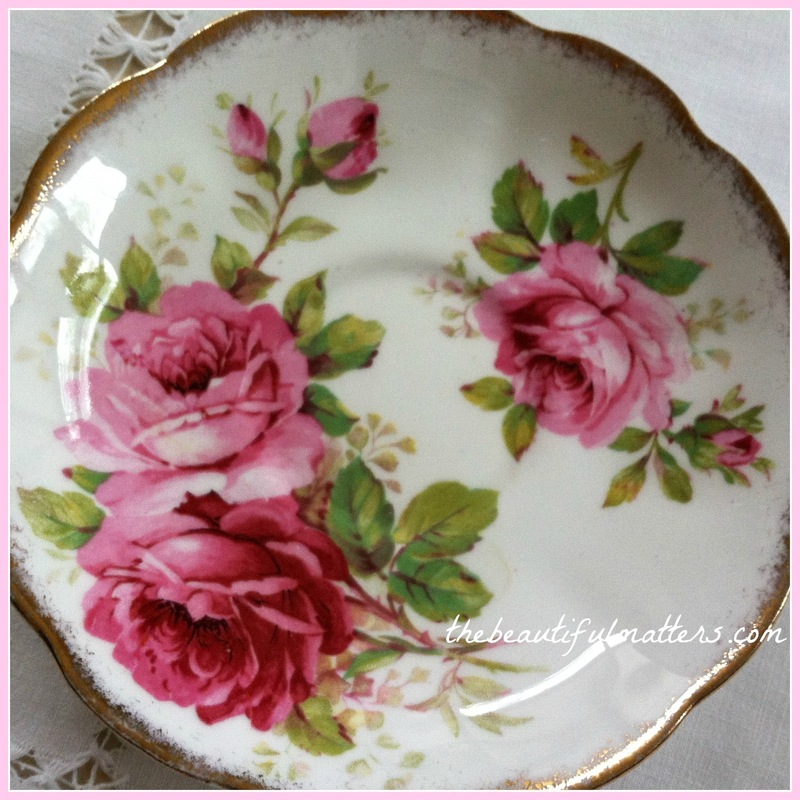 Love the American Beauty Royal Albert, always a favorite. Ah, I'll take coffee in my teacup any day. Thank you for visiting, Deborah, and for enjoying a cup of very raspberry October tea with me. You're still in time for the tags. I'll probably announce the two guests Friday. Hi Deborah--my mother is a breast cancer survivor so I'm always blessed to see people supporting the cause. And pink happens to be my favorite color, so anything to do with pink makes me smile. Hi Deborah! I love your pretty pumpkin from Celeste's shop - I have been eyeing a few myself :) She is so talented with her creations! And your tea cup is simply beautiful! Happy day, my friend. Hugs! Great cause! Love the cup and saucer! 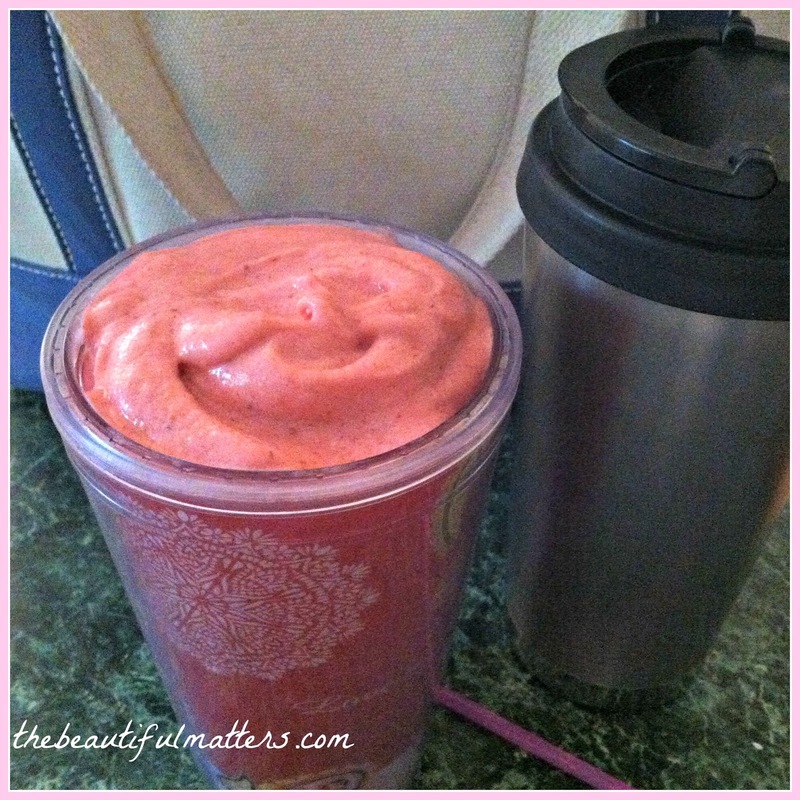 Wow -- I like the look of that luscious smoothie! Yummmm. A pretty collection of pinks, Deborah, and perfectly complemented by your hearty Ezekiel bread, which all make for a very cozy and comforting break.